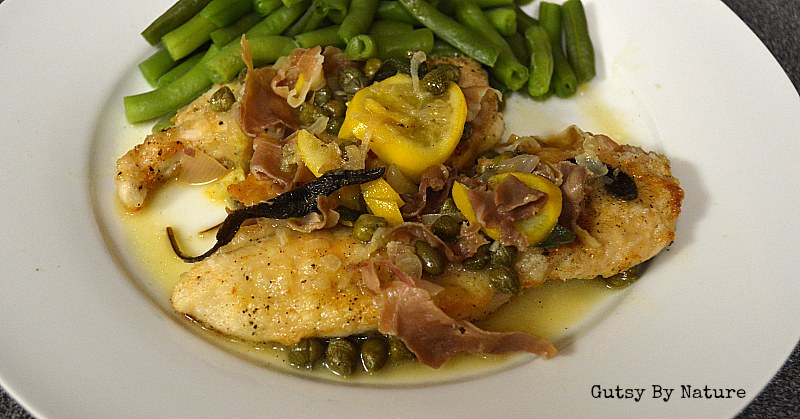 My favorite Italian dish to make at home is a lemon and caper chicken piccata and taking a close second to that would be anything made with prosciutto in the “saltimbocca” style. This recipe is my dairy free and grain free combination of the two, which I have probably completely butchered the Italian syntax by naming it “chicken saltimbocca alla piccata”! The Italian word saltimbocca is literally translated as “jumps in the mouth” and the dish by that name is traditionally made of veal which is topped or rolled with prosciutto and sage, marinated in wine, and then cooked. There are many variations in the cooking method and also many recipes that use chicken or even pork in place of the traditional veal. The word piccata refers to the food preparation method of meat being sliced, coated, fried, and served with a sauce. In Italian American restaurants that sauce is generally made from lemons and capers, leading to the misconception that many people have about what “piccata” should signify. Honestly, it really doesn’t matter what all these fancy Italian words do or don’t mean… all that really matters is this one: delizioso! I had two Meyer lemons left in my refrigerator when I made this dish most recently and it turned out amazing, but regular lemons taste great too. Typical piccata recipes will use wheat flour to coat the meat, but that is out if you need to be gluten free. I have tried a couple different substitutes, but have been most happy with tapioca starch (purchase it here) because not only does it give a nice crisp coating, but the residual starch helps thicken the sauce nicely. I know a lot of people dislike cooking in olive oil, but it really produces the best result here. Use an extra light tasting olive oil for lowest smoking point. Whole30 – Many piccata recipes use wine, but I have created this one without so it is still Whole30 compatible. Specific Carbohydrate Diet (SCD) – Tapioca starch is not SCD legal. You can substitute almond flour, or omit a coating completely. The texture will be different, but the flavors will be the same. Paleo Autoimmune Protocol (AIP) – This dish is AIP compliant! Low-FODMAP – Omit the shallots. 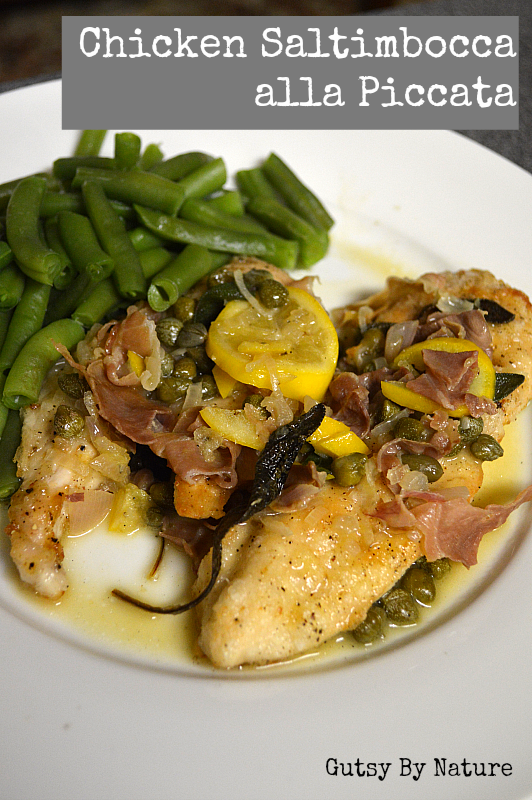 Made with prosciutto, sage, lemons, and capers; this dish really only needs one word to describe it... "delizioso"! Slice ½ of of one of the lemons and juice the other lemon and half of lemon to get about ⅓ cup of lemon juice. OPTIONAL, if using Meyer lemons: Chop the edible lemon peel. Set aside. Heat large skillet over medium high heat, add olive oil and allow to get hot. Season chicken cutlets with salt and pepper. Place tapioca starch in shallow dish and coat cutlets in the starch, shaking off excess. Cooking in batches if necessary, place cutlets in pan and fry until nearly cooked through and lightly browned (about 2 minutes), then flip and cook until lightly browned on the other side. Remove cutlets from pan and place on oven proof plate, keep warm in oven. Lower heat to medium-low. Add shallot and prosciutto to pan and cook, stirring constantly, for about 1 minute. Add broth, lemon slices and optional lemon peel, and cook until reduced by about half (about 4 minutes). Add sage, capers, and reserved lemon juice and cook for another minute or two. Place chicken on serving plate and pour sauce over top. This was seriously amazing! Really easy to make too. I used dried sage since I was too lazy (and cheap) to go get some fresh. 🙂 Roasted some green beans with it and it’s perfect. Thanks!